NOTE: Date must be in the form YYYY-MM-DD, like 2018-04-13. Breaking news: KY House votes to override Bevin's vetoes . . . UPDATED SUMMARY: The Kentucky House voted Friday to override Gov. Matt Bevin's veto of the legislature's tax bill, state budget bill and local pension funding bill, sending the legislation to the Senate for that chamber's consideration. Republican lawmakers said the tax-bill override was necessary to pay for additional education spending they put into the two-year state budget bill. Democratic lawmakers said they supported the school spending but protested the secretive way the tax plan was created and the way it raises additional revenue. The House voted 57 to 40 to override the tax-bill veto, 66 to 28 to override the budget veto and 94-2 to override House Bill 362, which allows a phase-in of pension cost increases for local governments. 2018-04-13 - Jones Chapel United Methodist Church, Gradyville, KY - Photo by Chad Parnell. Chad Parnell reports that the Jones Chapel UMC benefit auction for Bro. Mike Moon, recovering from surgery for pancreatic cancer, is getting overwhelming support even before the event tomorrow, Saturday, April 14, 2018. Over 100 items will be up for bid. The benefit begins at 5pmCT at The Clubhouse Grill, 647 Gradyville Club Rd., Columbia, KY with auction services provided by Dale Hayes of Bryant Realty. 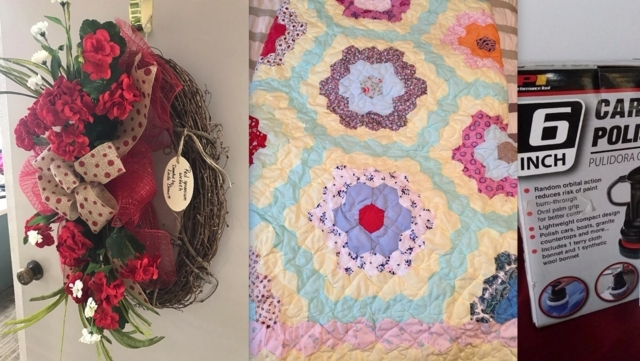 Examples of donated items include, at left, the Red Geranium Wreath, made and donated by Linda Bennett; center, full/queen quilt, made and donated by Margie Coffey; and at right, a car polisher and wax donated by A-1 Auto. Food will be served at the event. For more opportunities to bid if you cannot attend the auction, or to donate an auction item, contact Terry Partin at 270-378-1301 or Chad Parnell at 270-634-3220. FRANKFORT - (Fri 13 Apr 2018) - Attorney General Andy Beshear announced in a news release Friday that nearly 2,200 Kentucky small businesses can get money back from a Michigan-based company alleged to have sold scam services. Beshear's more than $398,000 settlement resolves alleged violations of the Kentucky Consumer Protection Act by Michigan-based The Mandatory Poster Company Inc., which also does business as Corporate Records Service. In addition to tours, the Lindsey Wilson College Intercultural Communication Tour, the group completed their look at American culture in past eras, with lunch at Bardstown's Old Talbott Inn, an establishment dating from 1779 that has hosted such notables as George Rogers Clark, Daniel Boone and Abraham Lincoln. Eighteen intercultural communication and international students at Lindsey Wilson College got a close look at American culture, including the role of women in American wars, during a visit Wednesday to the Civil War Museum complex in Bardstown. Focused on the Western Theatre of operations in the Civil War, the Bardstown museum features an extensive collection of uniforms, weapons, maps and other artifacts of America's deadliest military conflict. Just a huge worry for a respite from the big worry the Pythons gave us, "The Baggage Retrieval System they have at Heathrow." What do you do when some of the popular health food experts issue dire warnings about risks in your favorite raw foods? Yesterday, a standing-truth belief that fresh vegetables are more nutritious and better, came under challenge from a CNN story, Dirty Dozen listing foods, which, eaten raw, most often contain a high level of pesticide residue. In this article: Untamed wilderson just 229 years ago. . . Tucker's Station . . . ideal location for county seat . . . three founders of town . . . a commercially vibrant community almost from the start . . . the paper mill . . . the first electricity . . . early roads, and much more. . . Steamboats to Bowling Green, on the green, steamboats from Creelsboro to Nashville on the Cumberland. . . first postmaster . . . when swearing on Sunday was a crime . . . and then, as now, community was a leader in education, and more . . . This was an untamed wilderness, by our standards, two hundred and twenty-nine years ago when the first settlements were made here in what is now Adair County. Stout, fearless woodsmen and women made their way her under the direction of Col. William Casey and carved out a new life in this Eden of the West. One mile from this spot a stockade or station was erected and inhabited by a Methodist minister, Rev. John Tucker, and his family, along with a handful of others. Rev. and Mrs. Tucker met untimely deaths at the hands of those who did not wish them here. That didn't deter the settlers, it alarmed them for a time, but the flow was not stemmed. COLUMBIA, KY – (Fri 13 Apr 2018) The Lindsey Wilson baseball team hosts Kentucky Christian at Egnew Park, Lindsey Wilson Sports Complex, 928 Russell Road, Columbia, KY on Friday & Saturday, April 13 & 14, 2018, to close out their regular season home schedule. Friday features a doubleheader between the two teams with game one starting at 3pmCT. The series wraps up on Saturday at 10amCT. In between games of the doubleheader on Friday will serve as senior day for six student-athletes on the LWC baseball team. Bryce Collins, Alec Salcedo, Ricky Winfield, Louis Corral, Larry Stewart and Tyler Russell will all be honored. Charles Marshburn ventures ID of Mystery Plant #78158: Buckeye??? About: Morning Mystery #78158: Can you ID this plant & its life cycle stage? Buckeye? He was retired from the US. Army and Airforce and a member of the Greens Chapel Church and will be accorded full military honors at committal rites at the Greens Chapel Cemetery. He was the widower of Hwa Cha Taylor. He leaves one direct living descendant. Clifton M. Taylor, 81 of Jamestown, KY passed away April 6, 2018, in Des Moines, Iowa. Funeral services for Clifton Taylor will be at H.E. Pruitt Memory Chapel, 202 N Main Street, Jamestown, KY, at 11amCT, Saturday April 14, 2018, with Rev. A.R. Taylor, Jr. officiating. Friends may visit after 5pmCT, at the funeral home on Friday, April 13, 2018. Burial will be in the Greens Chapel Cemetery in Jamestown, KY, with full Military Honors. Declaration makes Metcalfe and 21 other counties eligible for aid repairing roads, bridges, and other infrastructure damaged by February Flooding. Metcalfe only county in CM 7-County area eligible for flood assistance from this weather event. Kentucky Governor Matt Bevin has been notified that 22 Kentucky Counties, including Metcalfe County, have been designated as eligible for Federal Assistance, as a result of flooding in a period from February 9-February 14, 2018. Other counties on the list, in addition to Metcalfe, are Bell, Breathitt, Clay, Estill, Floyd, Harlan, Johnson, Knott, Knox, Lawrence, Lee, Leslie, Letcher, Magoffin, Martin, Owsley, Perry, Pike, Powell, Whitley and Wolfe. This Presidential action "grants public assistance to the 22 impacted counties to repair roads, bridges and other infrastructure. The declaration will also provide the Commonwealth with mitigation funds." according to Governor Bevin. "Bringing federal assistance to Kentucky has been a team effort between our local, state and federal partners," said KYEM director Michael Dossett. "I am truly grateful that we can now begin the important process of moving recovery assistance into the declared areas." The Metcalfe County Farmers Market (MCFM) opening day is 8am-1pmCT, Fri 12 Apr 2018, at the Farmers Market Pavilion, across from the extension office, 422 East Street, Edmonton, KY. The MCFM will be serving made to order Breakfast Burritos and Curly Q's Potatoes. U.S. Senate Majority Leader Mitch McConnell: Quarles, KDA 'Well-positioned ... to Take the Industry to the Next Level'. Senator McConnell co-sponsors bi-partisan bill with Oregon's two U.S. Senators. Click on headline for complete story with link to Senator McConnell's remarks introducing bill. FRANKFORT, KY (Thu 12 Apr 2018) - Commissioner of Agriculture Ryan Quarles applauded the introduction of the bipartisan Hemp Farming Act of 2018 by United States Senate Majority Leader Mitch McConnell (R-KY) today. "This is a historic day for the Commonwealth of Kentucky, as Leader McConnell has introduced a bipartisan bill to legalize hemp as an agricultural commodity," Commissioner Quarles said. --Robert Stone, Friday, 13 April 2018. Adair County. Adair Co. Judicial Center, 201 Campbellsville ST. Columbia, KY. One (1) Event(s) Circuit Court. No (0) Events in District Court. Green County Judicial Center, 200 W. Court Street, Greensburg, KY. One (1) Court Event(s) Circuit Court. No (0) Court Event(s) District Court. Metcalfe County, Judicial Center, 201 E. Stockton Street, Edmonton, KY. One (1) Court Events in Circuit Court. Two (2) Court Event(s) cases District Court. Russell County. Judicial Center, 410 Monument Square, Jamestown, KY. Two (2) Court Event(s) Circuit Court. No (0) Court Event(s) District Court. Taylor County, Justice Center, 300 E. Main Street, Campbellsville, KY. One (1) Court Event(s) in Circuit Court. Three (3) Court Event(s) District Court.